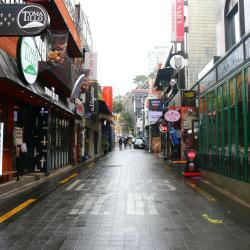 Looking for hotels in Gangnam-Gu? Stay Hotel Gangnam is conveniently locate 328 feet from Exit 3 of Yeoksam Subway Station (Line 2) and just a block away from Gangnam Financial Center. Great location; The subway station nearby around 1 to 2 minutes slowly walking distance.Clean room; Making up the room every day unless you mark 'do not disturb'. Kind staffs; Amicable staffs likely to help you. Useful Amenities; Great provided amenities, such as toothpaste&toothbrush, shave with save cream, soap, cotton swabs, etc you don't have to bring all stuffs with you if you are going to stay here. Centrally located in the business district, Mercure Ambassador Gangnam is just 509 feet from Yeoksam Subway Station. This property offers free internet, a fitness center and 3 dining options. It's located at the center of business district of Gangnam, Seoul Korea, and I could access everywhere by taking subway from nearby station. Best Western Premier Gangnam Hotel is centrally located in Gangnam business district, a short 5-minute walk from Shinnonhyeon Subway Station (Line 9). It provides free Wi-Fi and free wired internet. Value for money and good location. Featuring a fitness center, Aiden by Best Western Cheongdam offers rooms in Seoul. Ideally set in the Gangnam-Gu district, this hotel is located 4.3 mi from The Shilla Duty Free Shop Main Store. It was a typical nice hotel for a very affordable price. We stayed only for a night and thoroughly enjoyed our entire time there. There’s a bathtub in the rooms which is not something you always find in Korean hotels so that was great. Featuring spa facilities, Four Points by Sheraton Seoul Gangnam is located 1.4 mi from Cheongdam-dong, well known for luxury shopping and eateries. Free WiFi is available at the hotel. I liked the location the most. It was in the heart of Gangnam, with Garosugil only a few steps away. I had a really easy time maneuvering around the neighborhood. Very safe and the room is very nice. HUGE bed. Glad Live Gangnam is a modern 4-star hotel conveniently located 656 feet from Eonju Subway Station (Line 9). It houses on-site restaurants, a café and banquet rooms. Comfortable bed, clean and cozy room environment, i had good rest and deep sleep every night! Hotel Soulhada is a boutique hotel in Gangnam district, 1148 feet from Gangnam and Yeoksam subway stations (Line 2). The hotel has an in-house restaurant and provides 24-hour front desk services. Friendly staff. Nice convenient location. Very clean. Located in Gangnam, Hotel Uri& offers an on-site fitness center and dining options. 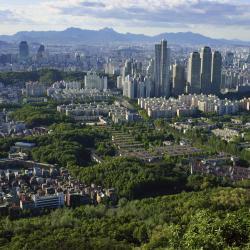 The hotel is 1804 feet from Samseong Subway Station (Line 2) and 820 feet from Korea City Air Terminal. Very clean. Very good location. Polite staff. Located in Seoul, Hotel Cappuccino offers free WiFi throughout the property. Guests can enjoy the on-site restaurant and bar. Private parking is available on site at an additional charge. Very clean. Comfortable beds. Friendly staff. Good location. Conveniently located just a 6-minute walk from Seolleung Subway Station (Line no 2), Hotel M.Biz offers modern rooms equipped with air conditioning and free Wi-Fi access. Staff spoke English well and were very friendly and accommodating. Room was comfortable. Grammos Hotel enjoys a convenient location just 984 feet from Yeoksam Subway Station (line no. 2) and provides comfortable accommodations with private bathroom facilities. Very cute. Staff knew English. Gangnam Family Hotel is located between Eonju and Sinnonhyeon Subway Stations (Line 9), each under 10 minutes on foot. It offers free parking on site and sauna facilities for female guests at a... They have excellent facilities in the room, even including microwave! Ibis Styles Ambassador Seoul Gangnam is located in the Gangnam area, next to Posco Center. It offers modern accommodations with a fitness center, sauna facilities and rooms with free internet. Very nice hotel with great bathhouse. Rooms very nicely finished. Staff very helpful and polite. Built in 2018, Patio 7 is located in Gangnam-gu district and within 1.6 mi of Cheongdam-dong, well know for an upmarket shopping area. Free WiFi is available at the property. The staff is really helpful and friendly. They have an amazing lounge downstairs.